The 2012 vintage has been absolutely amazing. The harvest in the Mittelhaardt is finally winding down after the longest growing season in many years. There are still a few parcels with bunches hanging—mostly in Forst and Wachenheim, but these will likely be harvested next [this] week (with the odd parcel of BA or TBA left to hang, not to mention Eiswein). This week was notable for all of the caravans of tractors and pickers from Bassermann-Jordan, von Buhl, and Bürklin-Wolf driving up and down the Weinstraße from Deidesheim to Wachenheim and back. The leaves on the vines have been showing beautiful shades of red and yellow for a few weeks now, signifying the end of the growing cycle and the completion of physiological ripeness of the fruit. What sets 2012 apart from other recent vintages is that due to a long, cooler season, this physiological ripeness has been achieved before a significant drop in acidity. We have seen must weights for Riesling in the high 80s, low 90s this week with total acidity in the 10-12-per-mil range and pH hovering around 3.0 or 3.1. Numbers, of course, don’t tell the whole story, but when coupled with the amazing flavors and aromatic intensity of the grapes that are coming in, we can be reasonably assured of a classic vintage in the making. Flowering was difficult in the spring for the earlier varieties due to cool weather, but by the time that the Riesling (and Silvaner) got at it, much of that coolness had passed. Hence, we haven’t had the trouble of extremely low yields in the Pfalz that I’ve been hearing about throughout the rest of Europe. Peronospora (downy mildew) and oidium (powdery mildew) were only mildly problematic and even then only at the very edge of the forest clearings. Botrytis has been virtually non-existent because of the cool weather and the lack of significant rain. Interestingly—and maybe paradoxically depending on your point of view—the healthiest parcels that I've observed have been from organic and biodynamic wineries. This can likely be explained by the relatively unproblematic growing season in regard to fungus pressure and the looser, smaller-berried clusters obtained through reduced fertilization, cover-crops between the rows which provide competition for water (instead of open lanes of warmer soil with higher proportions of free-nitrogen to drive the engine of growth), and the added measures of canopy management in many forms that more quality-oriented wineries employ. Soil also has great influence on botrytis outbreak. On the one hand, sandy soils, which make up a very large percentage of the Mittelhaardt, tend to produce grapes with thinner skins that are more sensitive to botrytis, though the higher drainage properties of sandstone counter the water-uptake of the vine and can prove beneficial in all but the rainiest of seasons. Basalt soil, on the other hand, rapidly breaks down into clay. It makes up a very small percentage of the Pfalz and is responsible for some of its greatest wines, most notably in Forst. The water and nutrient holding capabilities of clay can help to induce botrytis in wet years. The skins of the grapes may be thicker and the sugar content higher—the black soil retains heat extremely well—but the larger diameter grapes can burst through compaction of the bunches, which promotes botrytis infection. Muschelkalk, a shell-bearing limestone, which is found primarily in Dürkheim, Wachenheim, and also in the Südliche Weinstraße, can give a similar outcome, though vines grown on it ripen much later than those from basalt. Through the luck of the weather this year, none of these soils have been difficult and 2012 has produced the healthiest crop by far that I have seen. The wildly aromatic varieties such as Muskateller, Gewürztraminer, and Scheurebe should be excellent, being much more finely detailed and complex than last year with more acidity (important for Gewürz, in particular), but perhaps a little less floral. We picked Silvaner last week and it was the healthiest (zero botrytis) harvest that I have ever participated in. A joy to pick. It prompted us to make a small proportion in amphora. I think the first in the world, unless some crazy Weingut in Franken is on the case. Based on talking to others, Spätburgunder (Pinot Noir) will likely mirror 2008 in most regards, which is a good thing as that is the single best vintage of Pfalz Spätburgunder that I’ve ever tasted—aromatically superior, structurally sound, and under 14 percent alcohol. I don’t currently work with it though, so I will reserve judgment. 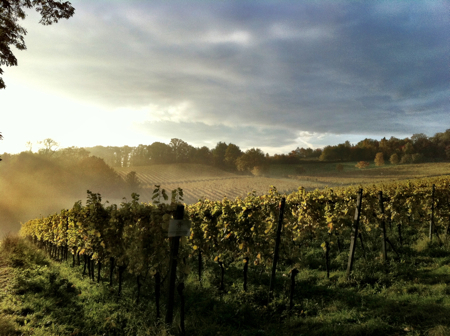 Photograph courtesy of Bill Hooper, the high-placed vineyard at Odinstal, in the Mittelhaardt. Bill Hooper is studying to become a winegrower and lives with his family in Neustadt an der Weinstraße in the Pfalz. Thank you for the great report. I’ll definitely be looking forward to the 2012s from the Pfalz! Thanks for the information, Bill. Your discussion of the various soils’ effect on botrytis is particularly interesting as well as your thoughts on the mechanisms by which organic vineyards were able to fight harmful rot in this particular vintage. These kinds of reports are timely and valuable. I’d love to hear Lars’ thoughts on the vintage in the Mosel and perhaps some contributions from insiders in other areas as well. Thanks for the hint, John. Admittedly, I’ve been slow in getting a Mosel 2012 vintage report up on the site, as I’ve been bogged down trying to rework an old piece on Mosel Kabinett. Bill’s article is indeed very good. Many of the producers that I’ve visited and talked to have finished fermentation, racked the whites off the gross lees and have administered the first sulfur addition. The old-schoolers who prefer sur lie have not, nor has anyone (like us) who relies on spontaneous fermentation -most of those wines haven’t finished and won’t until the spring when the cellar temperatures start to rise again (it’s getting cold here now and most cellars are under 15 degrees C.) We won’t start pruning until the first week of January, but many people, especially the bigger wineries, have already started. Right now, we are mostly dealing with shipping for the holidays and monitoring the wines in the cellar. Happy Holidays and get some Riesling in your glass!